Look Who’s at Fall Quilt Market and 20 % off all retail sales this week! This just cracked me up to the point that I had to take a picture of it! You’ve probably noticed in recent years that fabric companies keep signing up celebrity designers to design fabrics and who should come out with a new line this year other than Ty Pennington of Extreme Makeover: Home Edition! Who woulda thought…not me! On top of that, the crowd lined up to have a photo taken with Ty was so long that the police were present by the booth, just to keep everyone in line! Unbelievable, but it sure made me chuckle! We’re here in Houston at Fall Quilt Market, seeing all the latest and greatest new things in the quilting world and placing orders to buy these products for our online store. This is the first time we’ve been here as buyers instead of sellers and I’ll tell ya, it’s a lot more fun this way! I’ll blog more about products in the weeks to come, but just wanted to check in for now. I’ll say that it was just thrilling to sit for 1 1/2 hours today and browse through hundreds of beautiful batik fabrics in the Hoffman batiks booth. I may not sleep tonight dreaming of all the fabrics that will be coming our way in the weeks and months to come! To celebrate fall Quilt Market, we’re putting everything in the store at 20% off for all retail sales! That really does mean everything! Have you been considering a purchase of Electric Quilt 7? Now’s the time to pick it up because instead of $189.95, you’ll only pay $151.96! Thinking about a Sizzix Big Shot Machine? Instead of paying $99.99, this week’s price is only $79.99! Thinking of going whole-hog and splurging on the Sizzix Big Shot Pro? You can pick that bad boy up for only $319.20 instead of the everyday price of $399.00! Every single item in the store is 20% off the normal retail price until 11:59 pm EDT on Saturday, November 6, 2010. To get the discount, type 20% in the discount code box at checkout! What Isn’t on My Machine Bed?! Next time, I’ll know to finish all my flower edges BEFORE I add stabilizer to do the buttonhole stitches on the flourishes! Filed under Free Motion Embroidery, Sizzix. Comments Off on What Isn’t on My Machine Bed?! New From Old Quilt Contest Auction Begins Tonight! Just a quick reminder that the Alliance for the American Quilt is sponsoring a small quilt auction that begins tonight! This is a chance to pick up some nice small quilts for reasonable prices, and all proceeds will go to further the mission of the Alliance for the American Quilt. The quilt above is the one I made for this auction and it’s nothing compared to some of the wonderful donations they received. To find out about the bidding process and check them out , go here. Filed under Free Motion Quilting. 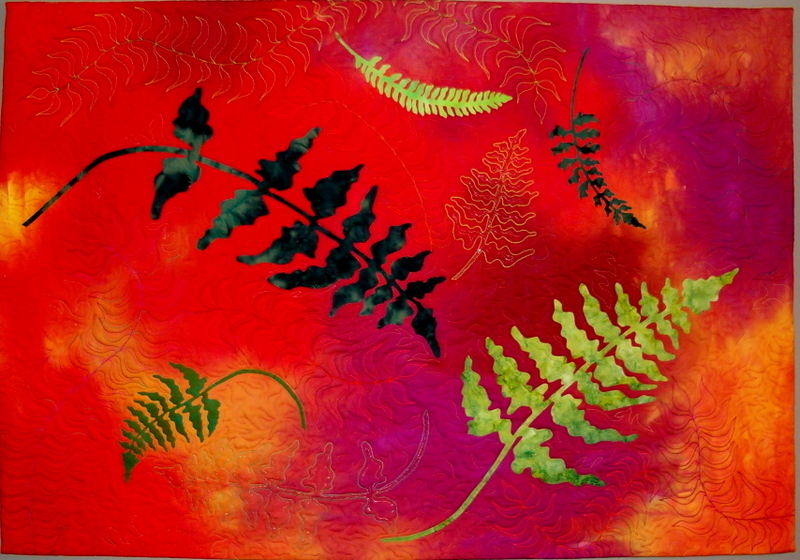 Comments Off on New From Old Quilt Contest Auction Begins Tonight! We’ve begun adding some video tutorials to our web site, and 6 videos were posted today. The first four videos are geared to the beginner level free motion quilter (although you may find them helpful no matter what level you are quilting at) and the next 2 are geared to the intermediate quilter. All the videos can be found here. If you’ve ever wondered about how to do the EKG edge finishing technique shown on the applique above, be sure to watch Free Motion Quilting-Intermediate I. 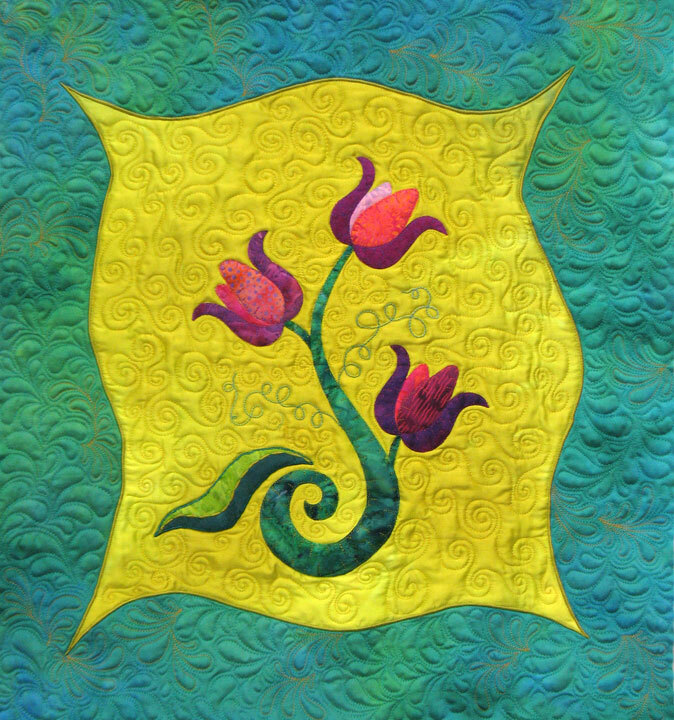 If you’re interested in learning about free motion embroidery or how to create wonderful curved edges to panels in a quilt as shown below, be sure to watch Free Motion Quilting-Intermediate II. 20% off all rulers! This includes rigid plexiglass rulers for cutting fabrics, flexible curve rulers, and swag rulers! Have you seen the Double Diamond Ruler yet? How about the House Ruler? If not, it’s time to check them out! 20% off all King Tut Threads; this includes both the 500 yard spools as well as the 2000 yard cones! 20% off all prepackaged fabric bundles. There are some new bundles in the shop this week, so be sure to check them out! To obtain the 20% discount, be sure to type oct23 in the discount box. Sale prices are good through 11:59 pm eastern time on 10/30/10. Check out this blog and drool!